Stapleton Kearns, “Waiting for Spring,” oil, 24 x 30 in. As we enter the winter season, I imagine plein air painting will cease for some. Oh, there will be hearty souls who will bundle up and trudge through the snow with their equipment, but I’m sure some are like me . . . basically fair-weather painters. I do paint winter scenes from life, but they’re usually done looking through a window while sitting in the warmth of my studio or from the front seat of a car. My hands, injured many years ago from prolonged cold, cannot tolerate even cool temperatures, so the ideal winter plein air experience for me would be a brilliant sunny day, a foot or so of unmelting snow, and a temperature of 72 degrees. I don’t imagine that’s going to happen anytime soon unless God again displays that nothing is impossible in Him. In the meantime, through a window it will be. Fortunately, there are some serious painters who thrive on experiencing fully all that winter has to offer. Aldro Hibbard (1886–1972) was one of those. Contemporary painters Stapleton Kearns and Joe Paquet are a couple of others. So, if you’re one of those purists who must stand in the snow to paint, these artists offer helpful advice. Joe Paquet layers up to the point of overheating before going out. He too experienced early damage to his hands, so they get cold faster than normal. Despite this, he still wears only a pair of thin gloves, because he needs delicate control of the brush, and he also carries some heat packs with him. Stapleton Kearns, “Snow and Barns,” oil, 26 x 29 in. Aldro Hibbard often visited the site beforehand and composed the picture mentally and memorized the impression it made on him. He’d set up the easel and during the first day make a layout on a large canvas. This was painted very thinly with plenty of turpentine, almost a watercolor technique, with colors that approximated the probable final scheme. If the desired effect was a fleeting one, he had several small canvases ready for very rapid sketches when the sun reached its appointed place. He would make several such sketches at different times before being ready to finish the large canvas. Sometimes the large canvas was completed in the studio, but his general practice was to complete them on the spot. Often, he would paint on a picture outdoors all day, spending the morning and midday on layout or underlay and waiting for the late afternoon to make the final color adjustments. Spending too long on one painting under rapidly changing light, he considered dangerous. When the effect is transitory, he preferred recording impressions in small sketches and relying upon them for the final painting. To overcome glare reflecting from the snow upon the canvas, he placed a piece of black cloth under his easel and feet. He liked to say the picture has to be painted on the palette. Unless the artist can judge the right color before it goes onto the canvas, he is lost. Kearns and Paquet each “prepare” their white paint for winter painting. Joe mixes cold-pressed linseed oil into his lead white before going out. Stapleton squeezes out a doughnut of white onto his palette and adds medium into the hole in the middle, whipping that together with a palette knife. Paquet uses New Traditions half-inch panels mounted with Clausens Linen (Type 15 for large works) and tones the surface prior to painting. He prefers this surface because it never goes slack, they’re lightweight and very rigid, and the sun doesn’t shine through them. The downside . . . they can become sails in strong winds. Kearns offers further advice: “We’ve all heard that snow is not white. So, what’s that leave? Red, yellow, and blue. Adding white to these three will enable you to achieve the high values you’ll need to make snow. Snow is opalescent. I’ll lay in a field of snow using a very high-key mixture of cobalt violet (red and blue) and then drive a high-key mixture of cadmium yellow and white into it (there’s the yellow). Forms are modeled by controlling how much yellow is added. Where the sun hits the forms, I’ll use more; as they turn away from the light, I use less. Violet can be added to describe forms as they turn away from the light. Don’t paint your snow in too high a key. Just as a photograph will lose its detail or modeling if it is over exposed, using too much white in snow will prevent you from modeling it. I suggest you drop the value down a bit from the way it appears on location. “The shadows on snow are the opposite of the color of the light, but that’s a generalization. Be careful to observe what is actually taking place before you and use that while looking for the complement of the light. I like to paint my reflected lights warm. Cadmium orange works for that. If your lights are warm, generally your shadows will be cool. Joe Paquet, “Brutal,” oil, 24 x 30 in. Joe Paquet, “Corner of Kent and Selby,” oil, 24 x 30 in. I can see what he means. Because of the cold, the normal thing would be to rush the work in order to get out of the cold as soon as possible. Not a good idea, Paquet says. In speaking with Stapleton, I was surprised that he does not call himself a plein air painter. He begins every painting on location, but like his important influence, Aldro Hibbard, he is not opposed to finishing each painting in the studio if need be. Joe Paquet also is not opposed to adding a touch or two in the studio if, as he likes to say, the painting starts “speaking” to him, telling him what needs to be done. What advice do you have for painting snow? Share it with us in the comments section below! NEW! Never has there been an instructional video or book that teaches a color system that is so effective that it can completely change the way you paint. You can create any mood, harmony, or flow in your artwork by using John’s color system. The best part is that you can do all of this with just 3 colors + white. Even though you’ll be working with a limited palette, you’ll be painting with unlimited color. LEARN MORE ABOUT PAINTING WITH A LIMITED PALETTE WITH THIS SPECIAL OFFER. 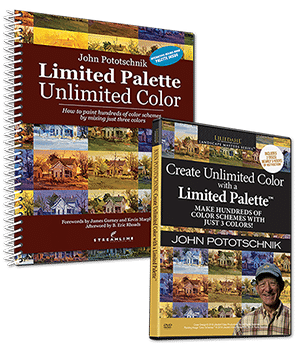 John Pototschnik (Poe-toe-sh-nick) is an Art Renewal Center Living Master, a Signature member of the Oil Painters of America and a Master Signature member of the Outdoor Painters Society. He teaches his painting techniques in the workshop "Limited Palette Landscapes," published by Liliedahl Art Instruction Videos. Thanks for a terrific article! I enjoy its many qualifications and nuances. You give us much to ponder toward making the winter plein-air experience work. I’m a long-time (though not so much a veteran as you) watercolor plein-air painter used to doing quick sketches that don’t often go much beyond that. But they sometimes don’t need to because of the WC itself. Some low-humidity days with declining temperatures that dip below freezing, it’s possible to apply the pigment with just enough water that it all freezes as it goes onto the paper, creating a marvelous crystalline effect that will stay if I don’t overwork that area of the painting but instead work quickly toward a finish and then leave the piece in my car to dry as is. If I’m successful, the piece will show as much work by Nature herself as by me and look magical! During intense weather, my every Thursday, year-round friends and I have sometimes relished in-car painting–bundled up well enough to withstand the cold (no idling the engine–wrecks air quality!). We’ve managed to paint during incoming river fog (cold front), flurries and even once a torrential downpour, resulting in some very interesting effects. We’re all growing older and less inclined to masochism, so many very cold Thursdays, we hole up together in an available café or ski lodge or private studio during a couple of less busy hours, nurse a coffee or two, and paint views from the windows. Even inside these places, the tablescapes and figurescapes can be adventures in still life and “urban sketching” for our practices. Our shows don’t sell much, but we do have a barrel of fun! Cheers to you, and if you’re in the Upper Valley of VT/NH, we’ll see you in the field! Your watercolor technique sounds very interesting, Suzi. I’m with you on the growing older part. There are some hardy souls out there, even though they too are getting older, that seem inclined to masochism. They are worthy of admiration. Glad you liked the article, Suzi. Thanks. I really appreciated the multi-artist viewpoints on how they approach the same problem and their individual solutions. On a practical note, I have found that a flattened cardboard box is a great winter staple for plein air painting. By standing on the flattened box, you put a insulating layer between your toes and the snow allowing for a longer session. Especially when the snow is a few inches or more deep, it keeps you from sinking down and getting your layered clothing wet. See you out there! Excellent idea, Erin. Hibbard used a black cloth, but that seemed to be for reducing glare, not so much about keeping the feet warm. I appreciate your input. Thanks, Erin. Because my husband and I ran an apple orchard in Maine for 21 years and pruning is done during the dormant season which is Winter, I worked outside during that season for many years. Pruning is more active than painting but still not as active as snowshoeing. I learned to overdress in the core section of the body since that would keep blood flowing to the extremities, hands and feet. I do that when I paint in the cold, and I always wear a hat and windproof outer layers top and bottom. My sister-in-law knit me fingerless mittens under which I wear windproof gardening gloves that are thin enough to allow for manual dexterity. I think standing on a box sounds like a good idea. I’ll have to try that. Sounds like good advice, Penny. Thanks. I loved Stapleton’s quote ; I heartily agree ! If you don’t love winter and snow , don’t paint outside . I happen to adore it . So silent and serene yet it can be brutal . I also wear lots of layers and a face mask. Invest in really good boots and put on yaks or “ chains” to avoid slipping on any ice . My fingers have been frost bitten so many times in my past days of skiing that I have to wear a mitt . I took a page from Aldro Hibbard ‘s wool sock on his hand and “ invented” a mitt that while bulky let’s me stay painting out in well below zero weather . A mitten liner with a hand warmer in the pocket , over which I put a thumbless mitt that I made out of a hand knit wool sweater . A slit to put my brush or palette knife through . Voilà ! Warm fingers ! I also use the Take-it Easel which can be stuck firmly into the snow to help prevent that “ sail “ phenomena when a gust of wind hits . Now all I need is the snow … those who have it , please send it to Wisconsin!! Thanks for contributing to the discussion, Lynn. We appreciate it. I’m in upstate NY and went out yesterday- probably about 20 degrees. I used big mittens with hand warmers (and put in my shoes, too!) I had problems with white- good advice above! Do you still paint dark to light? I was painting a grouping of trees in a snow-covered field. There was very little color to observe. Very gray day and gray subject. I wasn’t happy with painting and wish I had chose different subject. I only lasted a little over an hour. We’ll see what to day holds! Painting outside in the winter adds fortitude but maybe working from the car would yield better work. Jon,about finding the best insulation for painting in the snow or ici frozen ground i use rubber mats ,1 foot by one foot ,4 of them together interlinkt hold well together.they are made mainly for cold Garage floors.I buy them at Costco in a packet of 4 or six ,they pack well since you can take em apart.I paint like that around Lake Tahoe.Happy painting every body!